August is National Immunization Awareness Month (NIAM). The importance of vaccination has been debated back and forth over the last decade, with some parents deciding to forgo vaccinating their children. For some, it is concerns about side effects; others think since many of these diseases appear to be eradicated, why bother? Well, the reason we see less and less of these communicable diseases is because of vaccination. Some diseases (like polio and diphtheria) have become very rare in the U.S., largely because we have been vaccinating against them. However, this isn’t true everywhere in the world. Only one disease—smallpox—has been totally erased from the planet. Polio no longer occurs in the U.S., but it is still paralyzing children in several African countries. More than 350,000 cases of measles were reported from around the world in 2011, with outbreaks in the Pacific, Asia, Africa and Europe. In that same year, 90% of measles cases in the U.S. were associated with cases imported from another country. Only the fact that most Americans are vaccinated prevented these clusters of cases from becoming epidemics. Even if there are only a few cases of disease today, if we take away the protection given by vaccination, diseases that are almost unknown would stage a comeback. Before long we would see epidemics of diseases that are nearly under control today and we will undo the progress we have made over the years. Vaccines contain the same antigens (or parts of antigens) that cause diseases. For example, a measles vaccine contains measles virus. But the antigens in vaccines are either killed, or weakened to the point that they don’t cause disease. Vaccines help develop immunity by imitating an infection, but this “imitation” infection does not cause illness. It does, however, cause the immune system to develop the same response as it does to a real infection so the body can recognize and fight the vaccine-preventable disease in the future. In other words, a vaccine is a safer substitute for a child’s first exposure to a disease. The child gets protection without having to get sick. Through vaccination, children can develop immunity without suffering from the actual diseases that vaccines prevent. In the U.S., vaccines have greatly reduced or eliminated many infectious diseases that once routinely killed or harmed many infants, children, and adults. However, the viruses and bacteria that cause vaccine-preventable disease and death still exist and can be passed on to people who are not protected by vaccines. 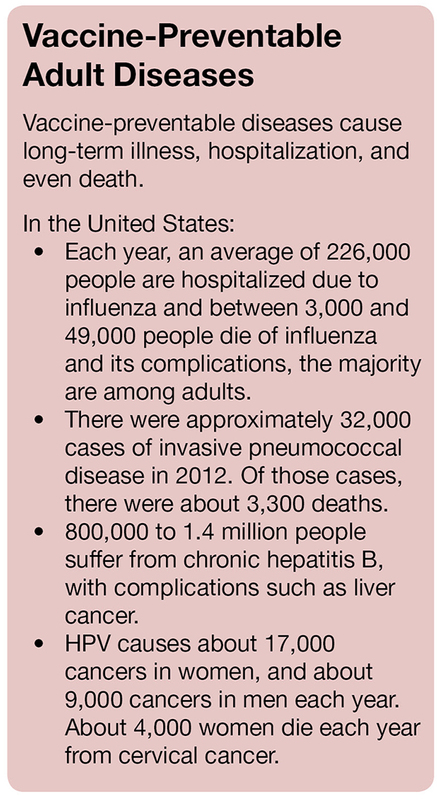 Every year thousands of adults in the U.S. still suffer serious illness, are hospitalized, and even die due to disease for which vaccines are available. Even if you were fully vaccinated as a child, the protection from some vaccines you received can wear off. You may also be at risk for other disease due to your job, lifestyle, travel, or health conditions. 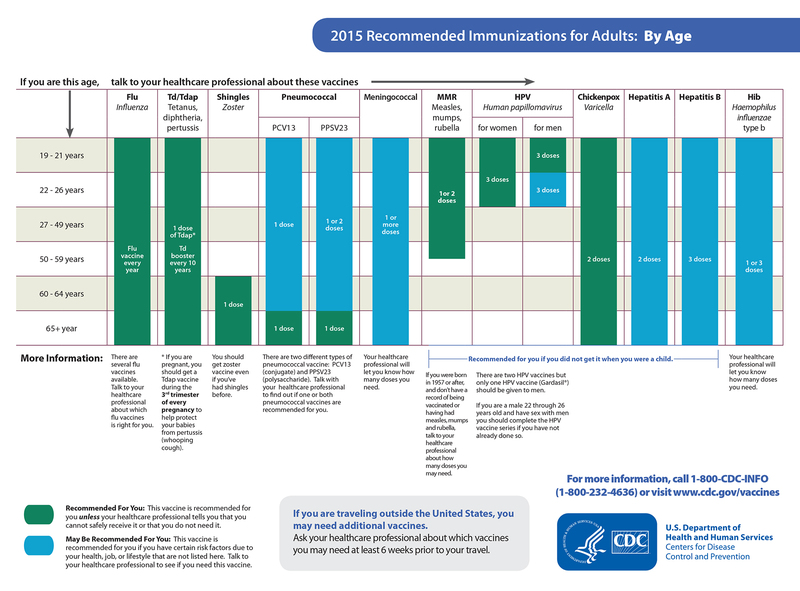 Find out what vaccines you may need based on different risk factors. Vaccines can reduce your chance of getting certain diseases. Hepatitis B vaccine can also reduce your risk of liver cancer. HPV vaccine reduces your risk of cervical cancer. Flu vaccine reduces your risk of influenza-related heart attacks or other flu related complications from existing health conditions like diabetes and chronic lung disease. Vaccines reduce your chance of spreading disease. Some people in your family or community may not be able to get certain vaccines due to their age or health condition so they rely on you to help prevent the spread of disease. Infant, older adults, and people with weakened immune systems (like those undergoing cancer treatment) are especially vulnerable to infectious disease. For example, newborns are too young to be vaccinated against whooping cough but it can be very dangerous or even deadly for them. That is why anyone in contact with young babies, especially expectant mothers, get Tdap vaccine to help protect them. Vaccines are tested and monitored. Vaccines are tested before being licensed by the Food and Drug Administration (FDA). Both the CDC and FDA continue to monitor vaccines after they are licensed. Vaccine side effects are usually mild and temporary. The most common side effects include soreness, redness, or swelling at the injection site. Severe side effects are very rare. Vaccines are one of the safest ways to protect your health. 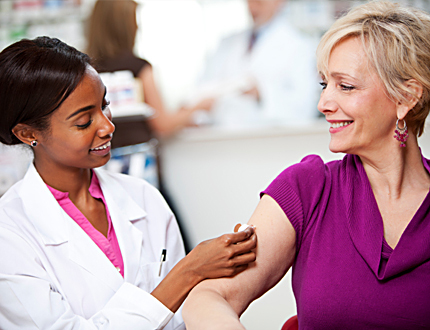 Even people taking prescription medications can be vaccinated. However, if you are pregnant or have a weakened immune system talk with your doctor before being vaccinated, as some vaccines may not be recommended for you. You have a busy life and too much responsibility to risk getting sick. Vaccines can help you stay healthy so you don’t miss work and you have time for your family, friends and hobbies. Getting your recommended vaccines can give you the peace of mind that you have the best possible protection available against a number of serious diseases.